Thanks to the latest innovative technology TreasureKnit can now weave captured memories into the fabric of a soft luxurious blanket. Because the photograph is knit into the blanket, rather than silk-screened or printed, the image on all TreasureKnit blankets stays intact wash after wash and will never fade or run. 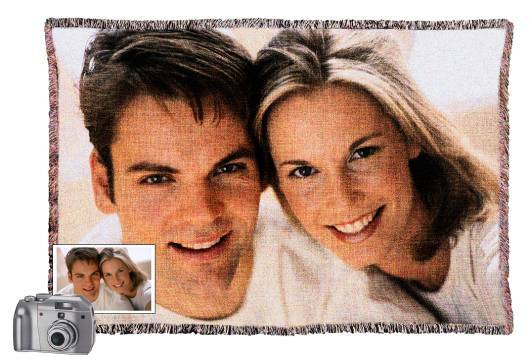 The Machine washable TreasureKnit photo blankets are a perfect gift for any occasion. Choose a favorite family photo, snapshot of the kids or a picture marking a milestone and create a lasting memory that will make a big impression no matter what the event. These soft and cozy blankets made from 100 percent hypoallergenic soft yarn and are available in three styles: TKOriginal, TKBellaire and the new TKColor, a one-of-a-kind full-color blanket with beautiful fringes for an extra snuggly feel. The TKOriginal Photo Blanket is made from super soft knitted black and white acrylic yarn with the image woven directly into the fabric. For those who prefer creating a decorative accessory for your home, the TKBellaire Photo Blanket offers five color combinations: natural plus wine, navy, green, brown or black. The TKBellaire is a finer knit soft mercerized cotton yarn with increased stitching detail for a sharper image. Invisible hanging casings allow you to hang the TKBellaire blanket for wall presentation or use it as a traditional blanket. TreasureKnit Photo Blankets are available in 5 sizes: Throw, Lap, Twin, Queen and King. Their prices start at $90. Turnaround time for orders is about 2 weeks. An exciting new addition, the TKColor Photo Blankets are available in a 50” by 60” throw for $129.95 and the turnaround time for orders is about 3 weeks. Ordering is easy – go to www.treasureknit.com and upload a digital picture or mail in printed photographs with an order form. Any photograph can be used, either color or black and white, wallet size to 8 x 10. A personalized message or text can be added to any blanket making it a great way to say Happy Birthday, Happy Anniversary or Merry Christmas!